The board has four quarters. Each quarter has six (6) Spaces (have the shape of a triangle), where the checkers can lie on. This is the space where the chips start from. The quarter that this space belongs to is called the Base Area and it is the first quarter. This is the quarter that all the chips need to be in, before the player can start to collect them. Since the Base is the first quarter, the Collecting Area is the fourth quarter. One interesting thing about the new system is that not all games will reward you 1 point if you win a game. Similarly, not all games will "punish" you with 1 point if you lose a game. Actually, it is not required the points that you could earn to be the same with the points that you could lose. This depends upon your opponents' points. This makes the online game more interesting, because now you can easily climb up the ranking of online statistics, but at the same time, if you are not carefull, you can climb it down. When you start an online game the application will inform you about the points that you could earn or lose. The list of available players gives this information too. We believe that the above actions will prevent some players from abandoning a game just before the lose it. The above rules are not enforced in the case where one resigns a game. The most important rule in the iTavli game is that you have to move the chip(s) as many spaces as the sum of the dice (or four times the dice if you roll doubles) is equal to. If you can not make this move, then you need to move one chip as many spaces as the largest dice (or if you roll doubles, the largest multiplier of the dice) is equal to. This may sound easy to achieve, but it can be tricky. Consider, for example, the case where you roll a 5 and a 3. Based on the above rule, you can either move one chip 8 spaces or you can move one chip 5 spaces and another one 3 spaces. At the begining of a game, you could easily follow this rule, but as the game progresses, and your opponent is blocking you, you may find yourself in the unfortune situation to make a move that you do not want to. So, in our previous example, if all chips could move 5 spaces, and there is only one chip that can move 5 and then 3 spaces, you have to move that chip. If you move any of the other chips, you will violate this rule. Starting with version 1.1, the iTavli is enforcing this rule. In the next figure, Player has rolled a 4 and a 3. The player could move two chips, but as you see in the figure, the player is not allowed to move the selected chip. 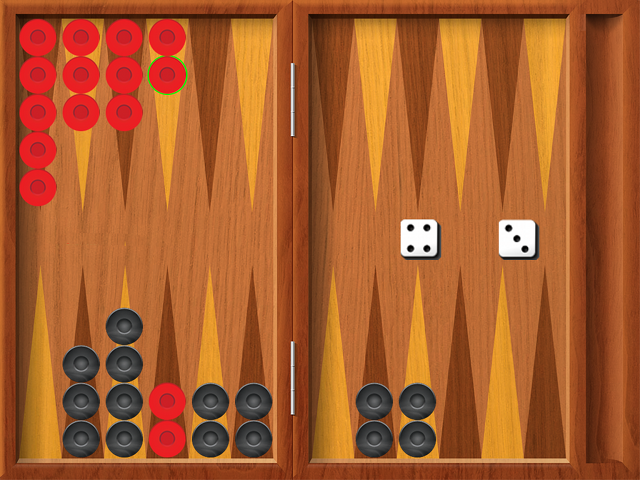 If the player had been able to move that chip, (s)he would not be able to play the first dice (i.e., 4). Thus, in this game, the player has to move one of the chips that lie across the board from the selected chip. The winner of a game is the one who first collects all the chips from the collecting area. You can start collecting chips when all the chips are in the collecting area. You may hit your opponent's single chip. If you do hit your opponent's single chip, the chip is removed from the game and is placed at the center of the board. If a chip is removed from the game, you can NOT move the other chips, until that chip enters the game. A removed chip enters the game from the base area. When a removed chip enters the game is allowed to hit your opponent's single chip which lies in your base area. You may hit (or block) your opponent's single chip. If you do hit your opponent's single chip, your opponent can not move that chip. You can place as many chips as you like on a blocked chip. You are not allowed to hit your opponent's single chip, and you may move chip(s) to open or friendly occupied spaces. When the game starts, you need to move one chip to your opponent's base area, before you can move the other chips. You can not block all 6 spaces in your base area! If your opponent can not move any chip (not because he/she can not roll the right dice, but because his/her chips are blocked), you need to move one chip to allow him/her to move his/her chips. Since each game has a different set of rules, each game requires a different strategy. In order to win the game, you need to move your chip(s) safely. If this is not possible, try to move them in the most safe space.